Have you noticed that it is getting colder in the mornings and in the evening? Where I live in Scotland seems to be getting colder and my colourful blankets aren't keeping me warm enough in the evening when I am at the computer or watching the TV. This left me wanting a chunkier blanket to snuggle under, and I had chunky light grey and dark red yarn in my stash that gave me the idea for a winter-ish blanket. I have always liked the colours that you see in some fairisle patterned jumpers which can have a lovely red, light grey and dark grey colour theme in them. Already having two of these colours, I managed to pick up a ball of dark grey yarn on my way home from work on Monday. Later that evening once I settled down after having dinner, I managed to get my newest WIP started!! Usually when I make blankets they are in some form of granny pattern, which I decided are not suitable for a snuggly warm blanket. Keeping it simple but not too boring I decided to try out the ripple pattern, which I have never done before (other than a little bit of dabbling and messing around). I like the ripple pattern, its pretty simple but keeps you interested enough with the decreases and increases in each row. I can't wait to get it finished so that I can use it to cosy under for the chilly evenings we have ahead of us! Are you getting ready for winter yet? I'm taking part in Tami's WIP Wednesday, head over to her blog and check out other WIPs!! I think you're blanket going to be lovely and super snuggly the colours are great. I have a ripple balnket on my future makes list, just have to hook my way through a load of wIP's first. Thank you! I have loads of WIPs, I will get through them eventually! But this one took priority because its so chilly! I love these colours together! This is going to be a fab blanket! 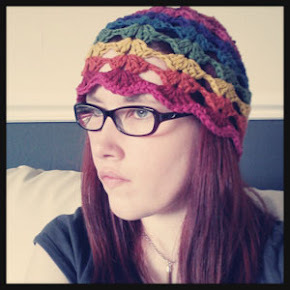 The ripple pattern is lovely, and those colours are just perfect for winter! The red looks terrific with this grey and white. Fall just started here and we're having like an Indian Summer where it gets warm after the fog burns off. Supposed to be hot on Friday and Saturday. But we San Franciscans really welcome cold weather here. I used similar colours in a shawl. they look great togehter. we've just come out of winter, and the poor ripple i started will probably have to wait at least another 12 months before completion! you always impress me with your ability to dedicate yourself to one project at a time. Love your colour mix - it looks brilliant so far. Spring has arrived here in South Africa (Johannesburg) - still a bit of a nip in the morning and evening air but the days are amazing! I made two ripple blankets for the winter (although here a DK Acrylic pretty much passes as snuggly warm - LOL!) In one of mine I actually used dark grey, light grey and red (plus quite a few other "autumny" colours) - I was dance up and down happy with the way it turned out! Can';t wait to see your finished blanket!! Yip, my thoughts are turning to winter too! I agree, it has definitely felt cooler recently (I am in Scotland too). 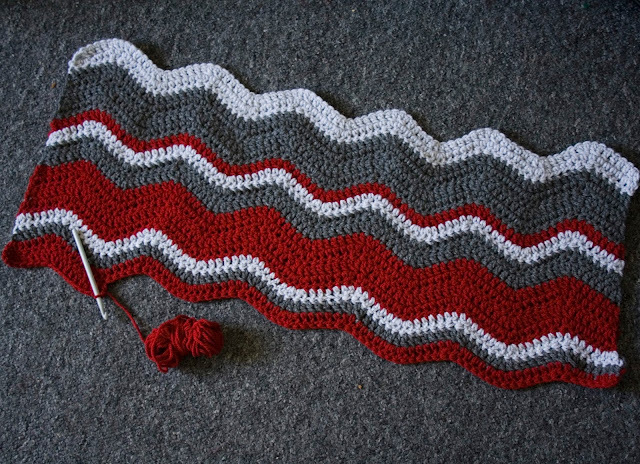 Your new blanket is going to be lovely, I love the ripple effect. I LOVE handmade blankets. Unfortunately, my favorite one unraveled a bit this summer when I washed it. Sigh. Was in Lerwick and the outer Hebrides in July and loved it. Where are you? I love these colours together! I'm definitely feeling the colder mornings and evenings but its still so warm in the day? Crazy weather! Thank you!! I just popped over to your blog! What an awesome start for a ripple. The colors are great! Thank you :) I wasn't sure at first, but I love how wintery they look! Hello dear Hazel. Happy to meet you. YOu just won a Hypsy Blanket pattern on my blog. Please let me know if you want it in US or UK terms. Lovely Christmas WiP you have going on there. I made a ripple in the same colors last year for Christmas. I realize now I never had a Voila moment for it on the blog.... I guess it has to be this year then when Christmas spirit comes around. Happy hooking. I am happy with it in either terms! But I would prefer to have it in UK terms please! And thank you, you should totally have a show off moment for your ripple blanket for this christmas!! I love this blanket - it looks so cosy!